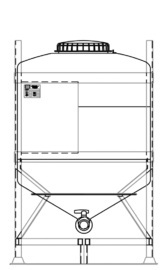 Reusable IBCs for liquid goods. 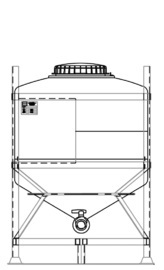 Capacities from 600 - 1200 litres. 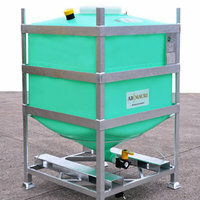 MTs are manufactured to provide users with tough long lasting liquids containment and transportation capabilities. Frames last many years and the liners can be replaced when necessary. 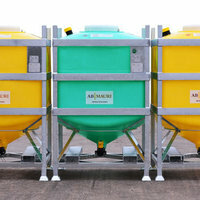 Refer to our IBC Utilisation Guide to see how to maximise IBC performance and to check whether your products are compatible with our IBCs. 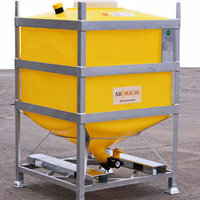 The MTC is a reusable IBC designed for the transportation and storage of liquids. The MTC liner is rotationally moulded in natural UV stabilised linear medium density polyethylene. 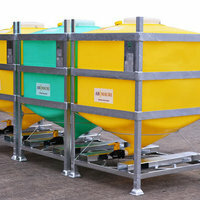 The polymer has strong resistance to industrial wear and tear. 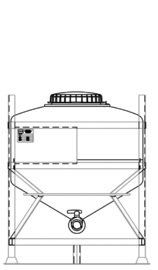 The liner base, which is conical in shape, enables efficient discharge and draining of fluids including high viscosity liquids. The liner has a fusion socket allowing the attachment of a wide range of outlet fittings. 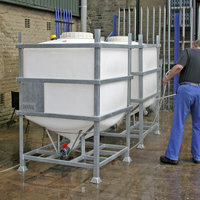 The liner is protected by a galvanised mild steel frame, providing excellent resistance to the elements. 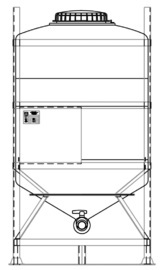 The units are interstackable for loading and space saving and have integral four way fork truck entry with anti-tilts to improve handling efficiency and safety. 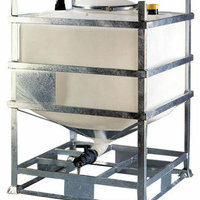 The liner inlet which is 350mm in diameter has a PP¹ screw cap fitted with a food approved O-ring seal as standard. The outlet is a 50mm single union UPVC4 ball valve fitted with EPDM³ seals. It is attached to the liner via a fusion welded 50mm BSP male threaded socket. A 50mm BSP female threaded end on each side of the valve terminates with a 50mm GRPP⁵ male camlock adaptor and dustcap. The dustcap acts as a secondary closure and is attached to the outlet valve via a cable. Please complete the form below if you would like to enquire about the MTC.